If the multiverse theory is correct, and every decision we make branches off into two or more universes based on the choices we do and don’t make, then there are endless other selves we might have become, some very different, some nearly identical. For most of us, it’s an interesting thought experiment, to imagine the paths not taken, the choices left unmade, that might be out there to make us other than who we are. For David Haller, those universes just might be an option—places into which he can project himself, different than he is here, to experience the him that could have been. “You decide what is real and what is not,” the Shadow King’s words repeat in the closing seconds of this episode. “Your will.” Over the course of “Chapter 14,” David goes careening through other realities, other Davids—it’s a chance to be anywhere but here. Anywhere, that is, in which there’s a chance his sister is still alive. And despite the mental journey through space, time, and reality, David ends up choosing his sister’s words over Farouk’s as the right ones. This isn’t what should have happened—but it is. It’s not entirely clear what’s happening at first, as the episode begins with an aged and homeless David, only to pivot to an elegant, wealthy David, followed by a bald and wizened David. It’s not until we pass the David sitting on the bus bench (where an ad for his sister’s real-estate business peeks out from behind him) and the camera slowly pans around, to reveal intern David juggling a bunch of coffees on the same street, that it becomes more apparent; we’re seeing the psychic playing out multiple versions of himself, in many different lives. And as these various selves go about their lives—some happy, some not, some seemingly damaged beyond repair—the story starts to come into focus. Even without meth-head David frantically explaining multiverse theory as a sop to audience clarification, “Chapter 14” comes together marvelously, a meditation on grief, regret, and pain that builds slowly, but earns every second of its cathartic conclusion. In execution, the closest comparison I could make would be The Leftovers, another show that made great art of loss and sadness. Whereas the characters in that HBO drama would often act out in ways that seemed to run counter to their everyday behavior, as they tried on new personas and varying attitudes as a means of shifting their grief to another register (or denying it altogether), Legion literally gives its main protagonist the opportunity to be other versions of himself. David’s power permits him the chance to alter reality, as Amahl Farouk puts it—to decided what is and isn’t real. And in the throes of loss, cradled by Lenny as he realizes his sister is dead, David puts those powers to work, projecting himself into numerous other Davids, looking at how his life might unfold given other choices. And some of those realities are grim indeed. The one we arguably return to the most is homeless, mentally unhinged David, pushing a shopping cart and barking at people and things that aren’t there. This David is exhausted, saying he has no use for this world any more, before the beating he suffers at the hands of four droogs (in a very deliberate homage) triggers his powers, vaporizing the thugs instantly. From there, it’s just a countdown until he’s cornered by Division 3, his mind disoriented by a drone emitting some frequency, and finally gruesomely cleaved in half by Kerry Loudermilk. There’s no relief to be found in this life. The same goes for mustached David. In this version, he never got off the drugs he took, and lives a highly narcotized existence, barely holding down a job stacking boxes and the like for Mary’s Sunshine Dairy. Here, Amy cares for him as she always did, reminding David to take his pills and sweetly ensuring he follows his routine. It, too, ends in disaster: The police stop him one night, and with David already agitated from catching a glimpse of the monstrous yellow version of the Shadow King, the encounter spirals into tragedy. First David flings the cop who hurts Amy into the sky, and then, after being shot, blinks everyone but his sibling and himself out of existence. More pain from more selves. 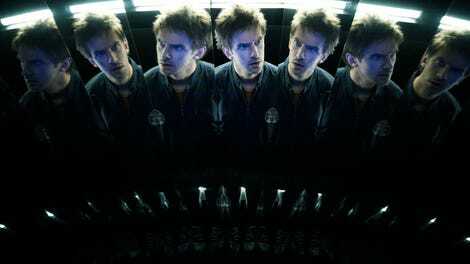 Try as he might, David Haller couldn’t make Amy and himself alright. There are plenty of ways to alter reality, but his sister was clear: This is the world, and unless he wants to give in to the evil of Farouk, remaking things as he sees fit, then this is how things are. He returns to this world not because the alternatives are all worse (the suburban David with a wife and two kids seemed perfectly happy), but because this is the world in which Amy lived. To abandon it would be, on some level, to abandon her. Spiraling through all the Davids there might be, there’s only one who feels this exact loss, this exact tragedy, in this exact way. 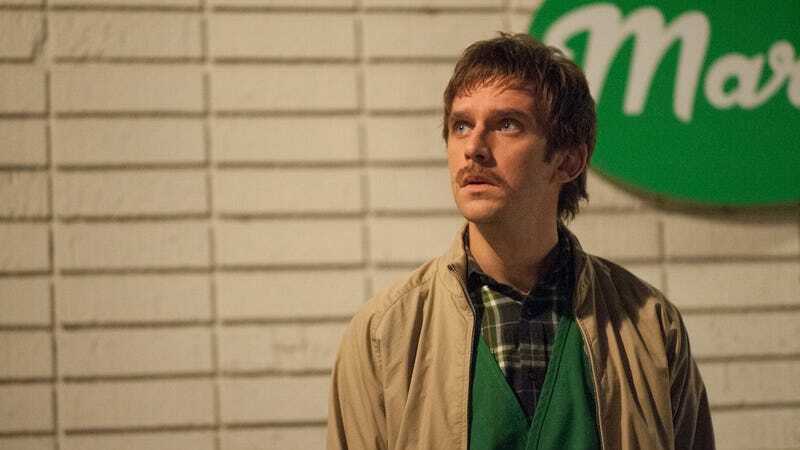 Legion used all of its tricks, elliptical meandering avenues of narrative, and bold stylistic embrace of spectacle this episode, all in service of the smallest and most human of tales. We suffer loss, and we grieve—superheroes included. Fun seeing Molly Hagan pop up as Laura, the woman who goes from being intern David’s benefactor to evil David’s long-suffering assistant. One of the more abruptly powerful smash cuts in this episode was from Kerry’s shocking evisceration of David to him as a boy, holding his face, mouth open in a silent scream. Legion significant music cues of the week: Along with the aforementioned Bryan Ferry, we get two covers, both of which I’m assuming are again composer Jeff Russo and Hawley, like last week’s Tom Petty cover): A potent version of Ten Years After’s “I’d Love To Change The World” (which recently had a similar cover version pop up on Person Of Interest) during the transition from the boardroom scene to the montage of Homeless David, and the The Clique’s “Superman” during the final moments and credits—though you’re more likely to know the R.E.M. version. R.I.P., Amy Haller. The show never gave Katie Aselton all that much to do, but this was a lovely and affecting sendoff for her character.